I left Naples on a fast train at 9:30 and arrived in Rome at 11:15. Fast trains really are fast. It was Friday, December 8, and the first day of a Jubilee Weekend. I don't know what a Jubilee is, only that it is an important Catholic occasion and Rome was packed. I found the Enjoy Rome tourist office near the train station and they were able to get me in a small room in the historic center of Rome for 150,000 lira, about $70. Under the circumstances that was a good deal, but it was more than I wanted to spend. This is what my $70 room looked like. Just wide enough to walk by the single bed, just long enough to allow room for a small table at the foot of the bed. The door swung out into the hallway because there was no room for it to swing into the room. Not the smallest room I've stayed in, but it came close. I took the room for the weekend and moved on Sunday to a larger room near the train station. 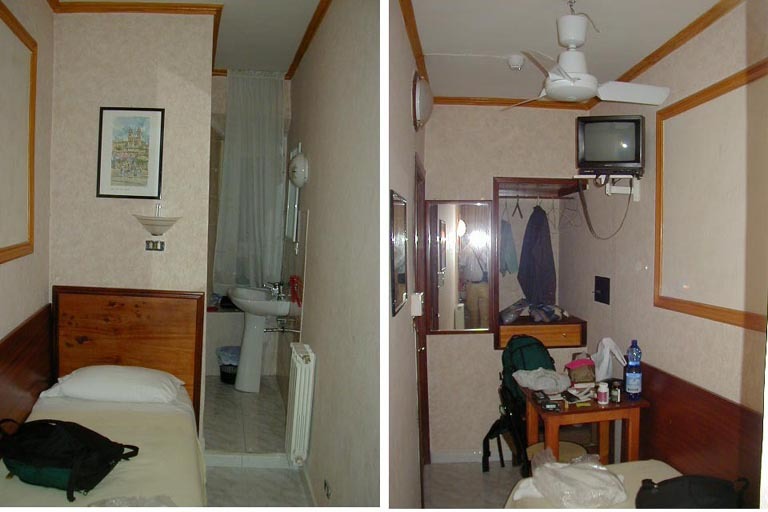 This worked out better, the room near the train station cost 60,000 lira, less than $30, and was closer to a metro station than my expensive room in the center. The area near the train station in Rome was much nicer than in Naples. I also found the bar scene to be better there than anywhere else in Rome. Nothing great, but at least I had something better to do than sit alone in my room at night. 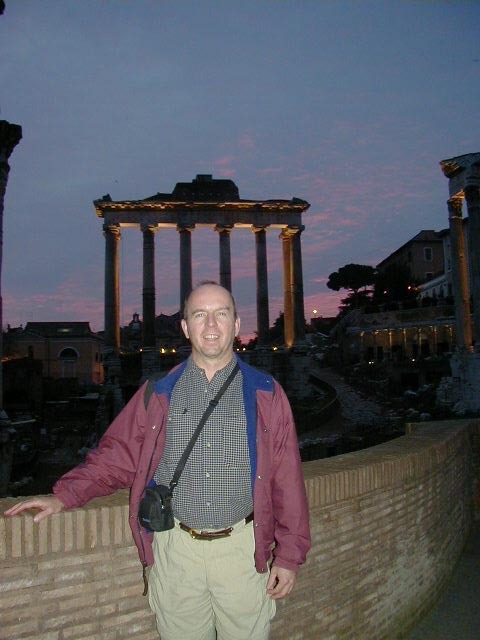 An interesting thing about Rome--every English speaking ex-patriot I met was a woman. I met ex-pats working as tour guides or in bars, or just hanging out in the outdoor cafes, and every one was female. I'm sure there are male ex-pats in Rome, but they seem to be greatly out numbered by the women. In earlier pages I mentioned meeting wife hunting American men in Russia, Scottish men Estonia, and Austrian men in Lithuania. None of these women would admit to man hunting in Rome, but I wonder. 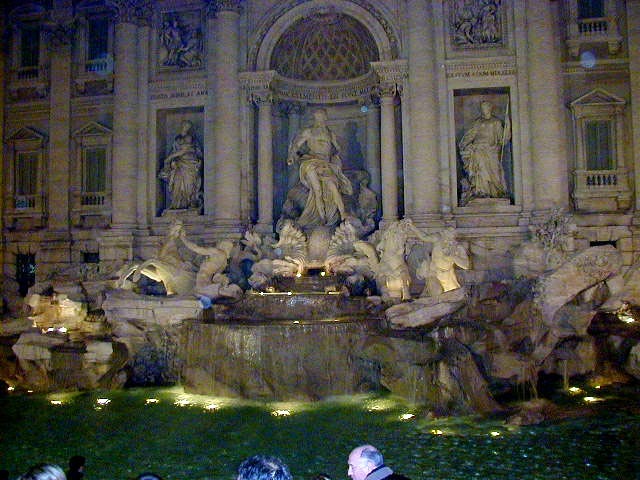 Another interesting thing about Rome, my only two experiences with pickpockets during the entire Europe trip occurred in there--on Friday while in the subway station trying to reach the expensive hotel, and on Sunday when I was taking the subway back to the train station for a cheaper hotel. In both instances I had a large pack on my back and a daypack in hand. On Friday, when I had stopped to look for signs to the correct boarding platform, a group of about six Gypsy women beggars quickly moved in on me from all sides, pushing cardboard signs in my face and clutching at my clothes. This is a well known approach used by pickpockets; distract the target, grab anything accessible then make a quick getaway. It is described in my guidebook. I put my free hand in the front pocket where I kept my spending money and trotted away as quickly as I could while saying "No, no, no...". I got away without losing anything. My second pickpocket experience was on the following Sunday when I was about to step on a subway car, once again with a large pack on my back and the daypack in hand. I heard someone say "Attencione" and just then a group of Gypsy's, one adult woman holding a baby and several children, rushed into the car with me as I was stepping in. The children then formed a wall in front of me, acting disinterested in me but pressing against me and preventing me from moving away from the door. It was early, I hadn't had my morning coffee, and it took a moment before I realized what was going on. At the same time I decided to plow through this wall of children I felt a small hand dart in and out of one of my pants pockets. The children gave way, the woman looked offended and said something I didn't understand, and an Italian man looked at me knowingly and said "Pickpockets." I replied "I know" and checked my pockets to make sure they hadn't taken anything. They hadn't. The Gypsy's got off the car at the next stop and ran off, presumably looking for another potential victim. For those who think I'm being anti-Gypsy, I disagree. I'm being anti-pickpocket. I know the Gypsies have been subjected to centuries of brutal, sometimes murderous, discrimination, that they are probably the most impoverished minority in Europe, and there are many honest Gypsies. However the Gypsies most likely to approach a tourist are the ones living down to the bad reputation they have all over Europe. Watch yourself over there. Especially when you are on the Rome subway loaded down with luggage. Enough of the observations and warnings. 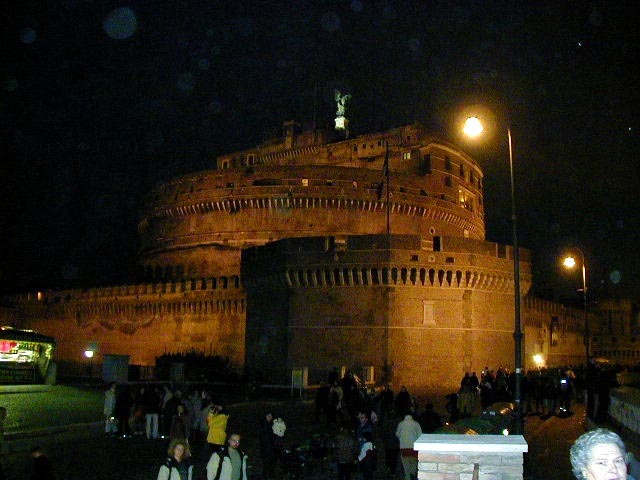 My first weekend I went on the Enjoy Rome guided tours of Ancient Rome on Friday and the Vatican on Saturday. I covered the same ground again during the week to see the sites at my own pace and without the crowds. Never go to Vatican City on a Jubilee weekend. On to the sites. 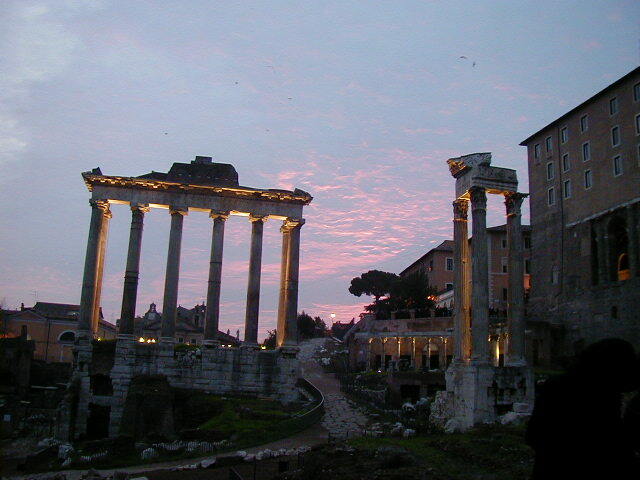 Starting with Ancient Rome, some pictures were taken during the early evening and others during the day. 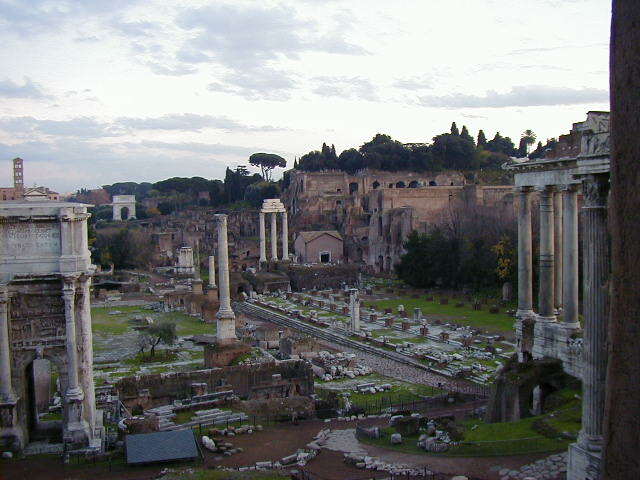 From left to right below is the Roman Forum with Palatine Hill behind it, the Temple of Saturn, me, three columns--I'm not sure what of, and the Temple of Vesta. 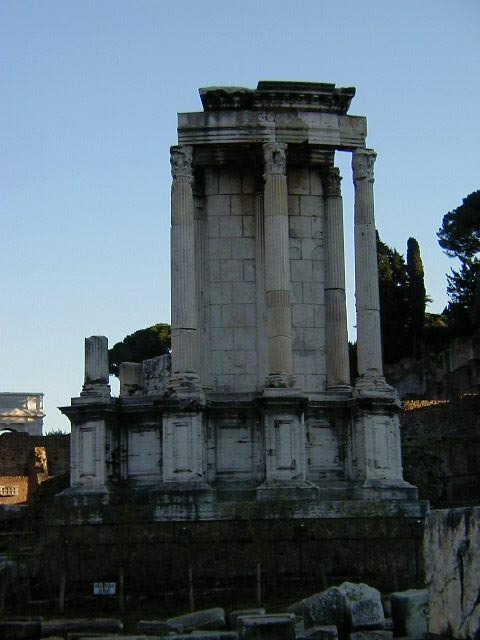 This last temple was comparatively small but Rome's most important; it was where the sacred flame was kept by the Vestal Virgins. It was a great honor to be chosen to be a Vestal Virgin, but the Roman's were pretty unpleasant if they thought one of these women had not lived up to the virgin requirement. The ex-virgin was buried alive in a coffin with a candle and a loaf of bread so she could live long enough to consider her crime. While digging the foundation for a Planet Hollywood in Rome the coffins of many of these unfortunate women were found. 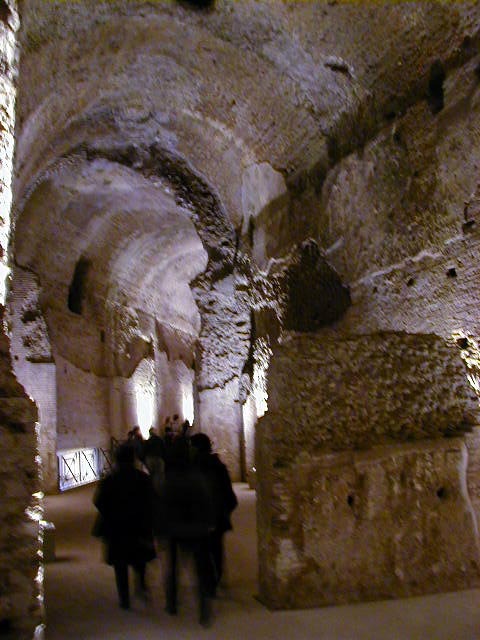 It is hard to dig anywhere in Rome without finding something historic. 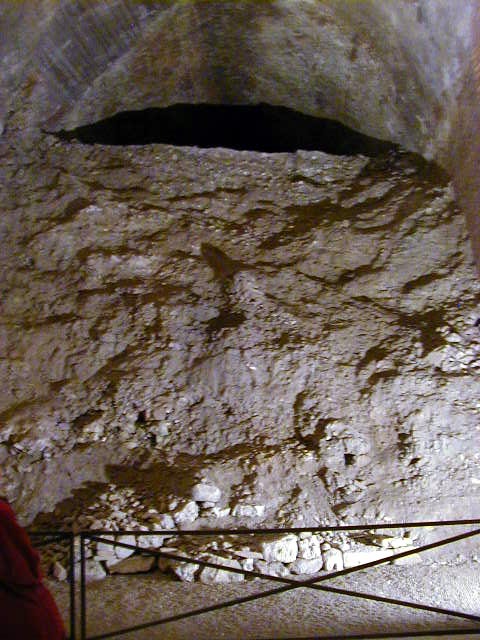 Construction was halted, the area was studied, and construction resumed after the coffins and remains were moved. Understandable, we can't have deflowered virgins hanging around Planet Hollywood. 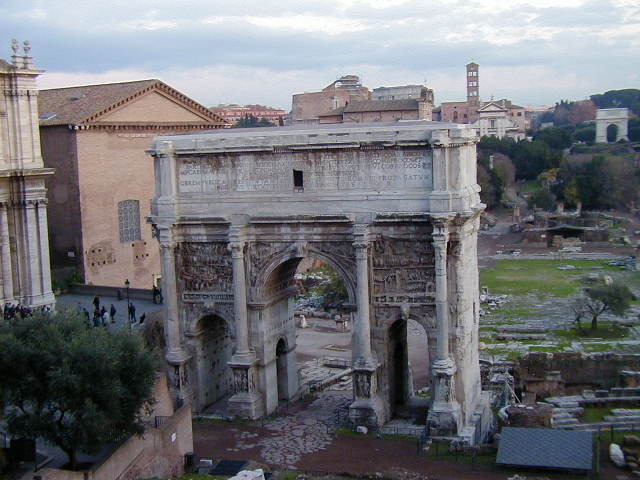 Continuing on Ancient Rome, we have the Triumphal arches; the Arco di Tito, built in 81 A.D., the Arco di Settimo Severo, built in 203 A.D., and the Arco di Constantine, built in 312 A.D. Notice how the newer arches are larger than the earlier arches? Every emperor who commissioned a triumphal arch wanted it bigger than the earlier arches, so people would think their triumph was greater than their predecessors'. 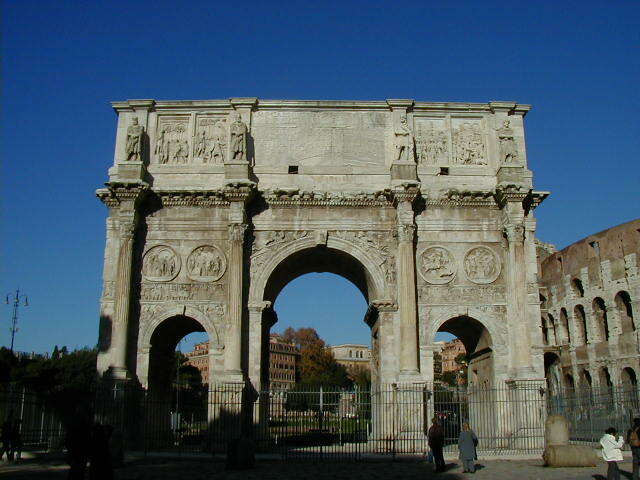 Constantine's Arch was the biggest because it was the last one built while Rome was capitol. Constantine later moved the government of the Roman Empire to Byzantinium, which was renamed Constantinople. At the time most of the wealth of the empire was in the east, and most of the invading barbarians were in the west. Good reason to go east. 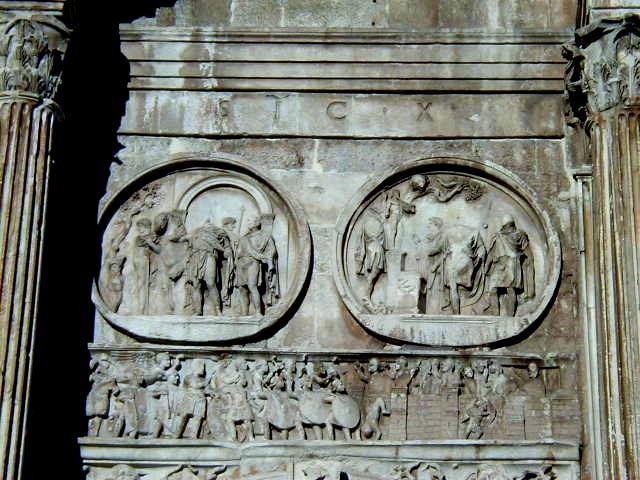 The last picture is a detail showing the varying craftsmanship on the Arch of Constantine. 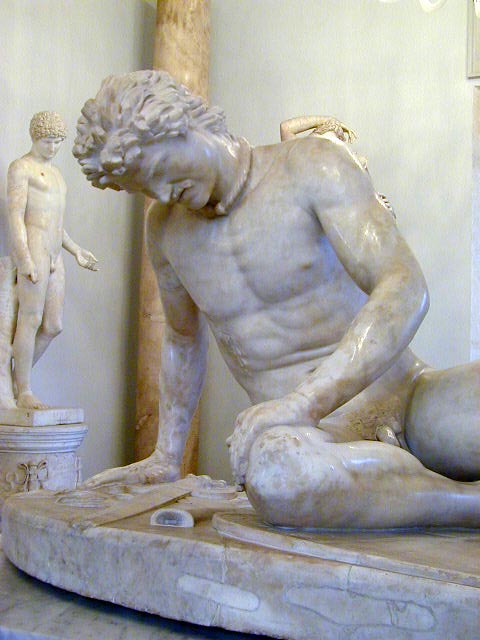 By 312 A.D. Rome was in decline and the quality of workmanship was declining with it. 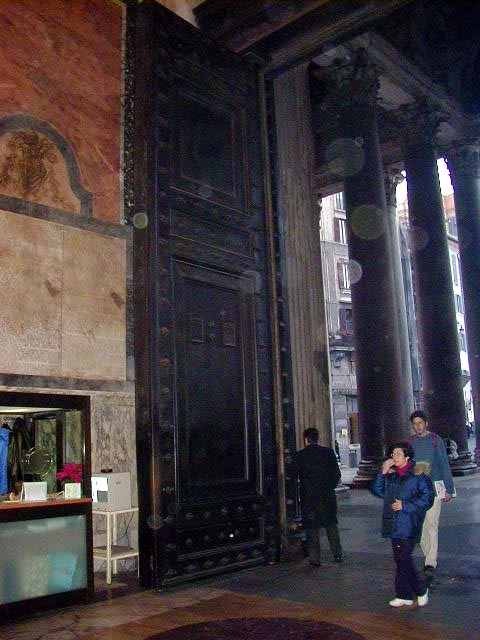 So Constantine used a combination of new work and decorative elements robbed from other buildings in Rome. If you look closely you'll notice a significant difference in quality between the top and bottom bas relief carvings in the picture. Next is the exterior and interior of the reconstructed Roman Senate building. I expected such an important building to be more ornate. After that is something big being restored--I couldn't figure out what, but it is impressive. Last is the world's first mall. 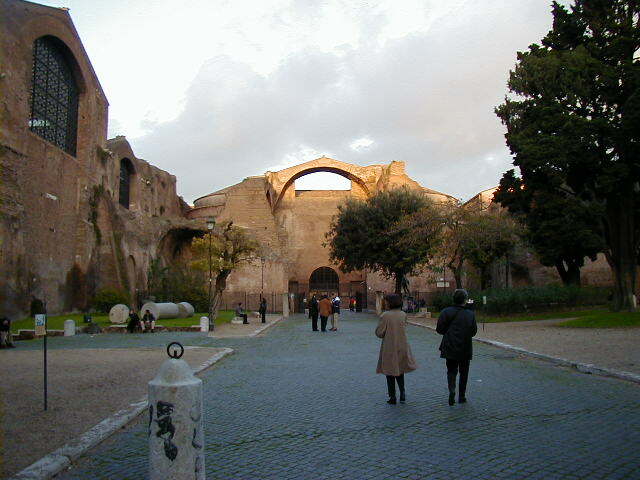 Built by either Trajan or Hadrian (my memory and notes fail me), it was built of red brick and was originally much larger and contained hundreds of shops. Over the years it was partially dismantled to make other buildings. If you are looking for a building material that will last a couple of thousand years, you should consider red brick. 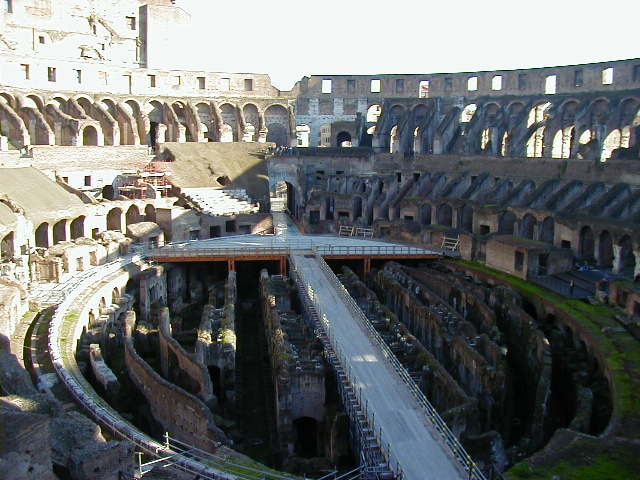 Finally comes the Roman Colosseum, known as the amphitheater in ancient Rome. 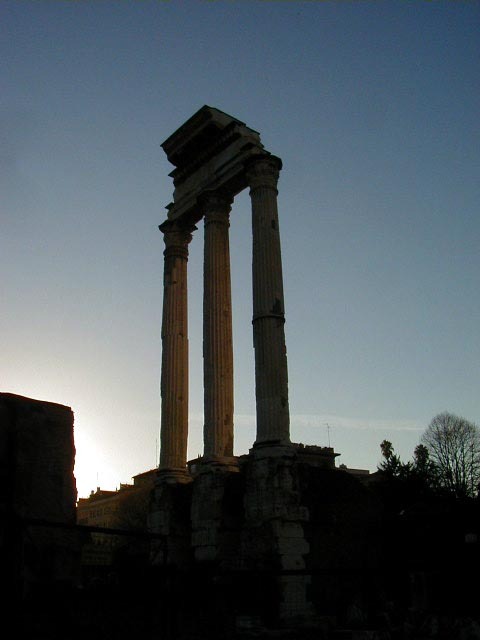 It was renamed because of the Colossal statue Nero had erected of himself nearby. 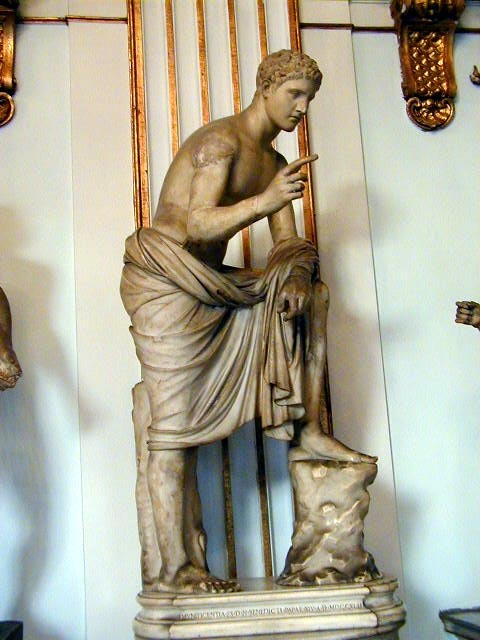 For years after Nero was gone the Romans would update the head on the statue to reflect the current emperor. The statue is gone but the name stuck to the amphitheater. 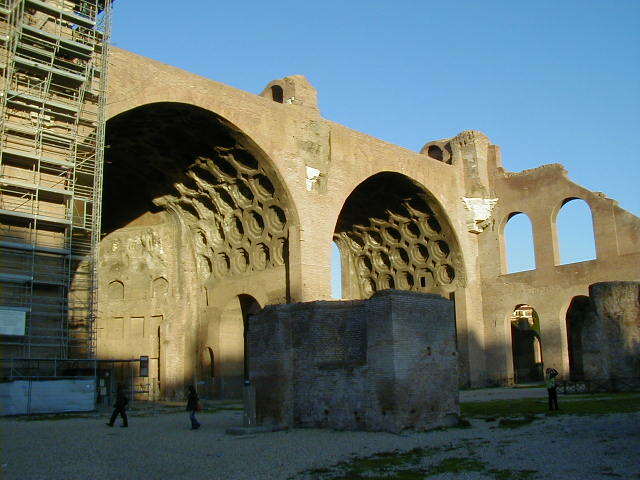 The Colosseum was a sophisticated structure which originally had a convertible top (the cloth roof could be opened and closed to shelter the spectators from the sun) and trap doors in the floor. The Romans preferred to watch many pairs of gladiators fighting simultaneously, so the trap doors were used so new gladiators could pop up ready to fight when the number of competitors thinned out. 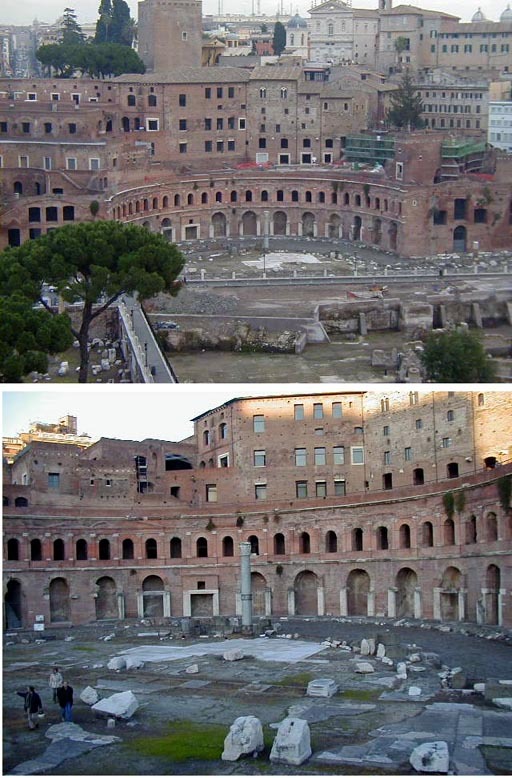 After the Colosseum was abandoned it was quarried for its' marble in the middle ages, but the main structure stood largely intact until a massive earthquake in 1349 caused a large part of the outer walls to collapse. 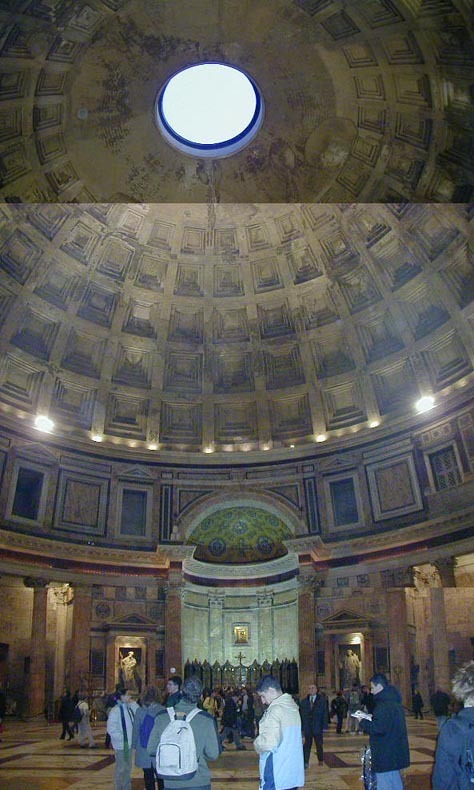 The most impressive structure from ancient Rome is the Pantheon; a temple built in 120 A.D. as a one stop location to worship all the gods of Rome. It was later used as a church, and probably has had other uses; I don't know its' complete history. 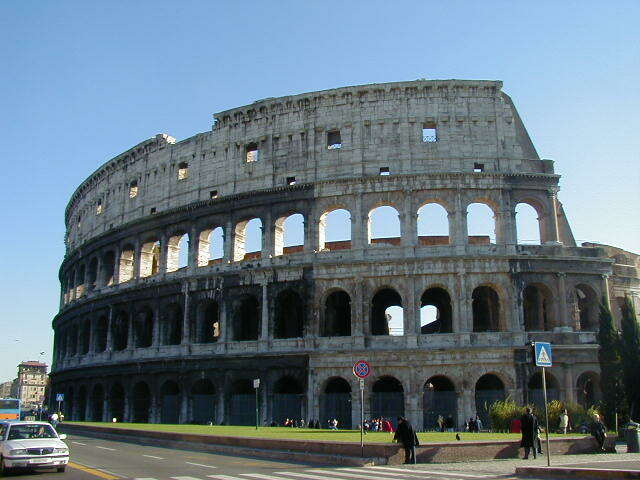 The 1349 earthquake that toppled much of the Colosseum only put a crack in the dome of this huge building. It is really well made. 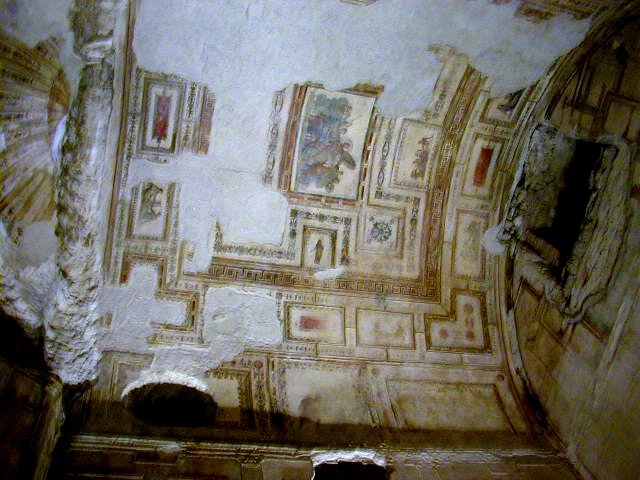 During my Ancient Rome tour I found out that part of the remains of Nero's house had been excavated and recently opened for tours. Nero liked to do things big. 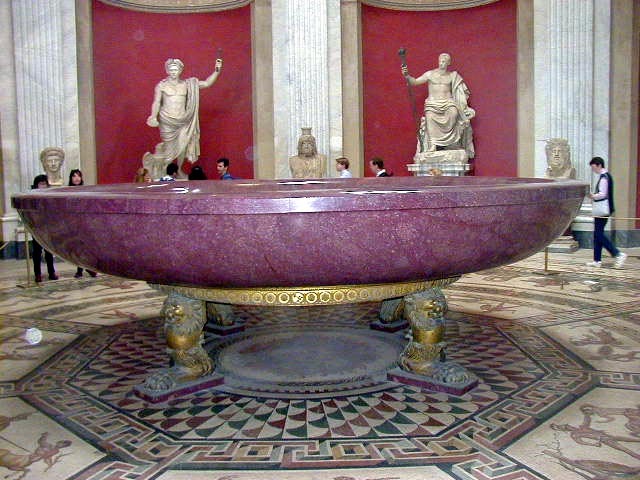 According to the guide, this is one of his birdbaths, now in the Vatican museum. 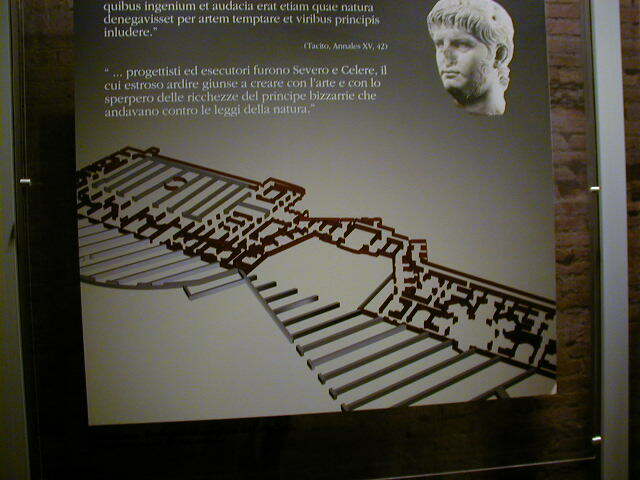 After Rome had burned, Nero bought a lot of prime real estate cheap and built a house that was about a mile long. To quote Shrek, "Do you think he's compensating for something?" 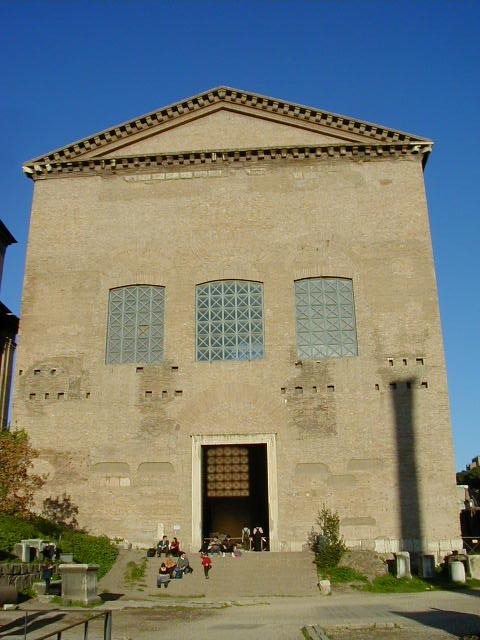 After the Roman citizens revolted and Nero committed suicide, his house was stripped of everything portable and buried, with the Baths of Diocletian built on top. 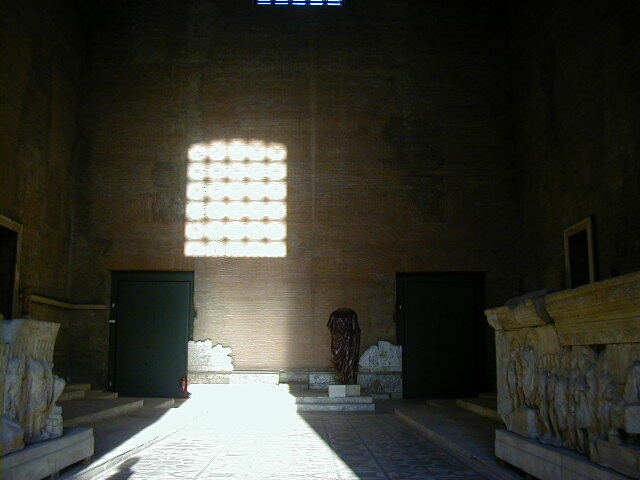 This is the entrance to the Baths. 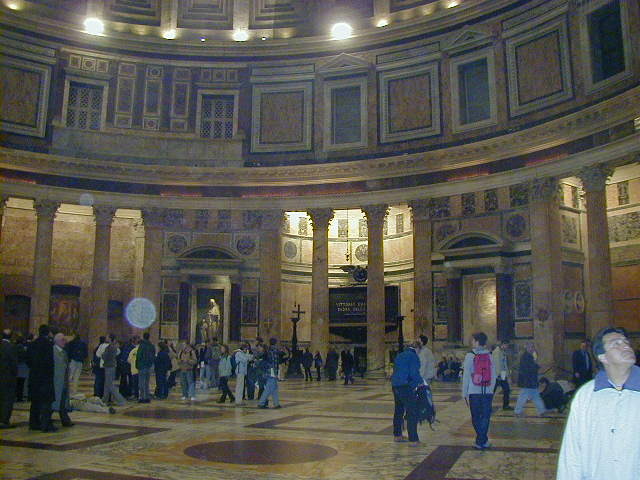 Inside were a couple of moderately interesting exhibits on inscriptions and the legend of Romulus and Remus. I was kind of disappointed, I had hoped to find restored baths, or at least an exhibition on what the baths had originally been like. 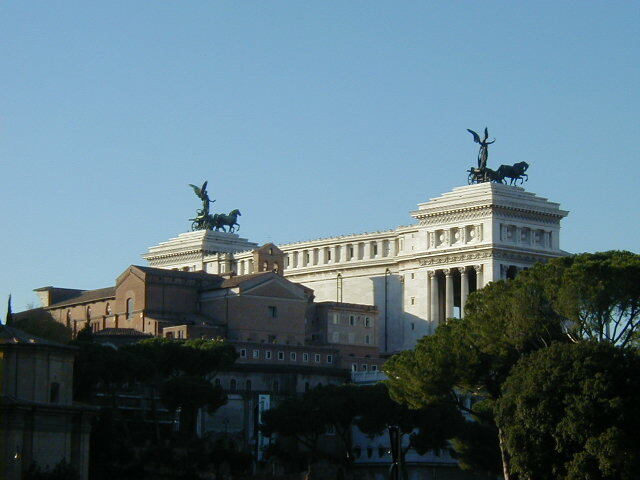 Just north of the Forum is the Piazza Venezia, a monument built on top of ruins of ancient Rome in the nineteenth century to commemorate the creation of a unified Italy. According to the Enjoy Rome guide the modern Romans aren't very pleased by the location or the structure itself, referring to it as the "macchina da scrivere"--typewriter. To give an idea of the scale: The horse and rider statue you can barely make out in the center of the first picture once held a large VIP dinner party inside the belly of the horse. The second picture shows the back of the Venezia, which is unimpressive because there is nothing there. 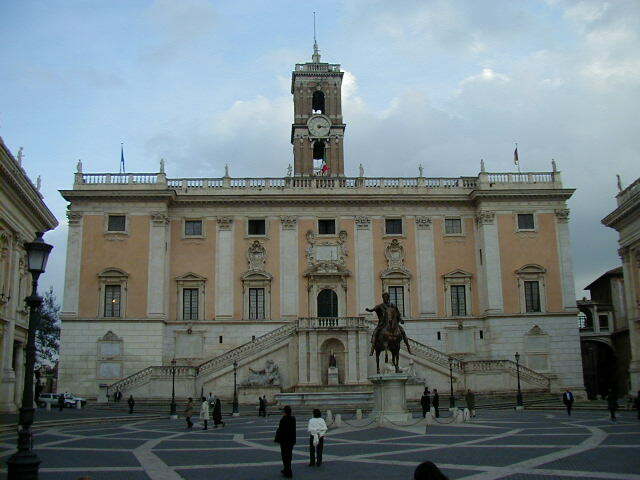 The Piazza Venezia isn't a building, just a facade that looks like a building. 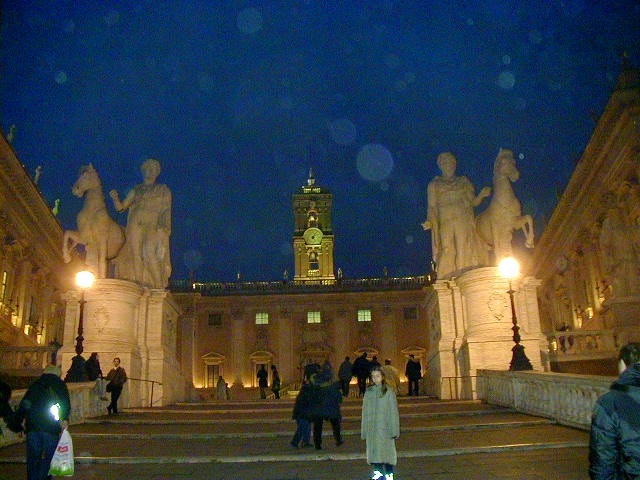 South of the Piazza Venezia, on the edge of the forum, is the Piazza del Campidoglio. 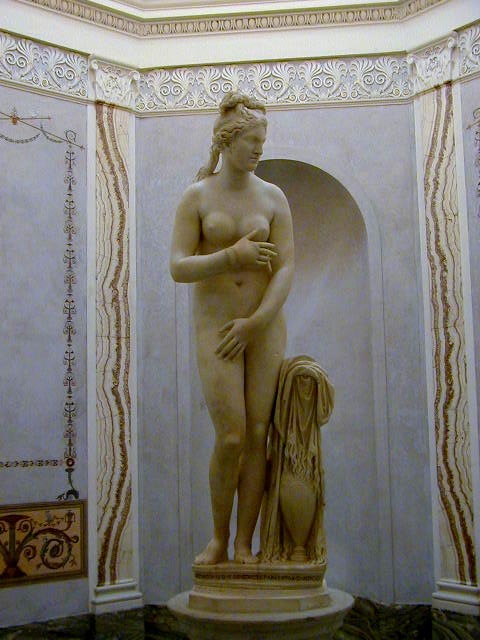 Designed by Michelangelo in 1538, it is on Capitoline Hill, the seat of ancient Rome's government and modern Rome's municipal government. 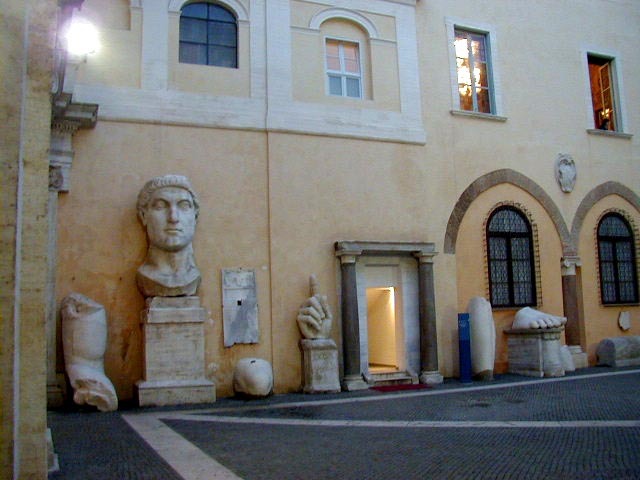 In addition to the municipal government, the Piazza del Campidoglio also has the Musei Capitolini, which has an excellent collection of statues and sculptures. 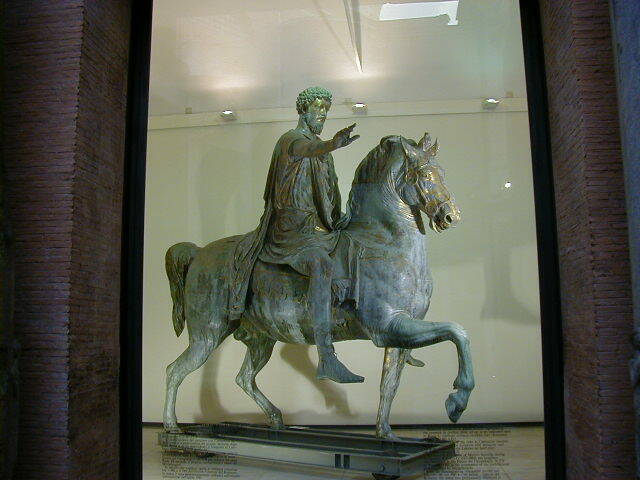 The statue has an interesting story, it is of Marcus Aurelius and was found by the early Christians in Rome. 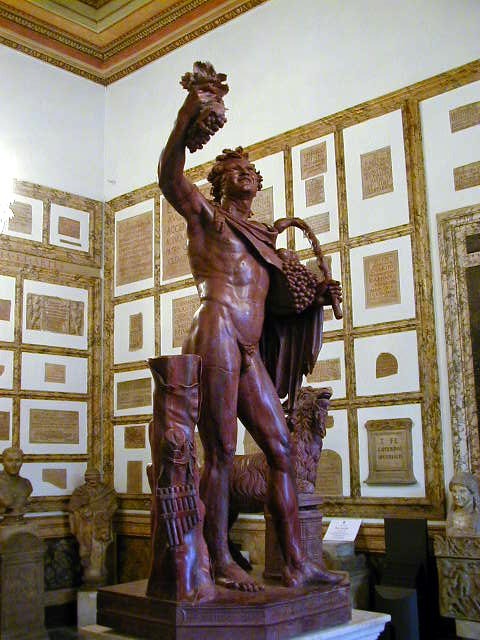 Normally they would have destroyed it as a pagan statue, however it was incorrectly identified as a statue of Emperor Constantine, the emperor who legalized the Christian religion. 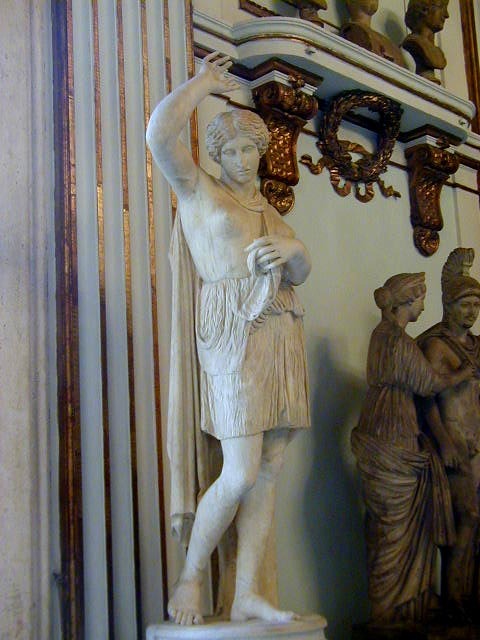 Since it would have been ungrateful to destroy a statue of Rome's first Christian Emperor, (Constantine converted on his deathbed), the mis-identified statue survived. 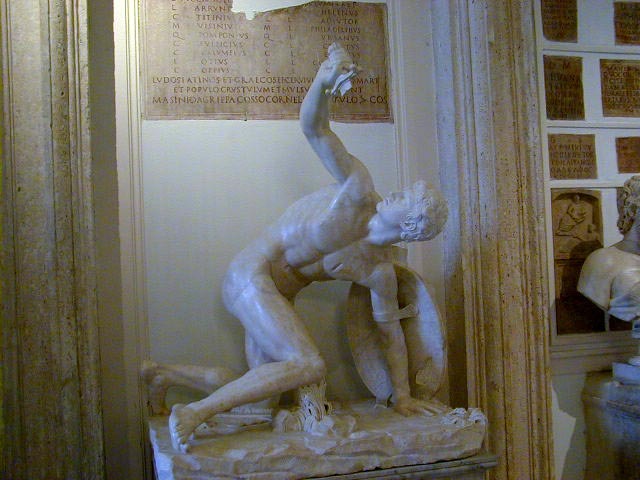 This is the original, kept inside the museum to preserve it. A copy is in the center of the plaza. There were hundreds of museum pieces in addition to Marcus above, but I especially liked these--Venus, Defeated warrior, Wounded Amazon, a boy choking a goose (it must be from a popular mythological story), and Dying Gaul. All of these were popular themes for statues. 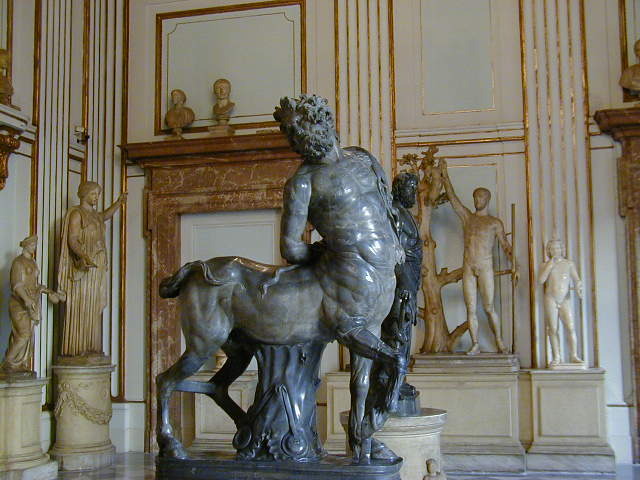 Three other nicely done statues, that I wouldn't call popular themes, are a Centaur, a partying Satyr, and somebody in conversation. This next one is a hoot. 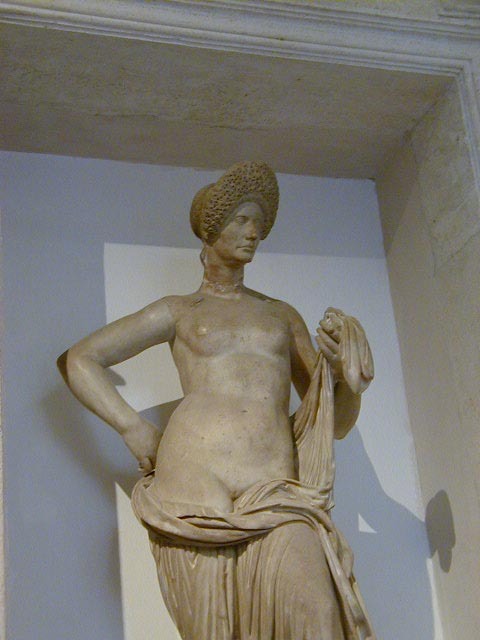 Somebody took an accurate sculpture of a patrician woman's head and stuck it on the body of Venus. It was probably meant as flattery, but the results are horrible. Behind the museum are the pieces of what had been a colossal statue. Romans sometimes built really big statues. 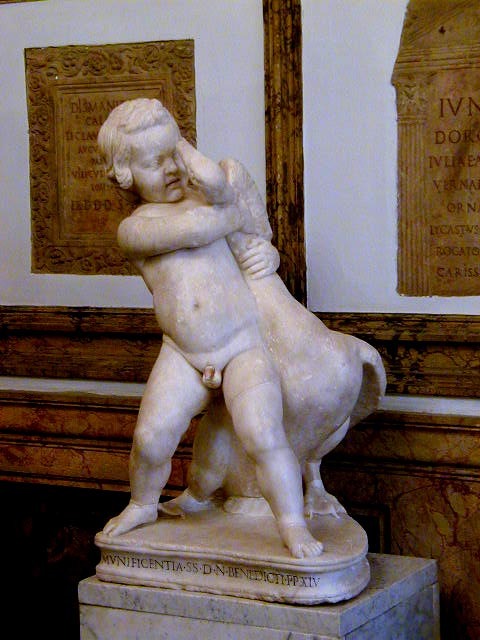 The last picture is one of the most famous works from antiquity which has become the symbol of Rome--a statue of Romulus and Remus being nursed by a she-wolf. 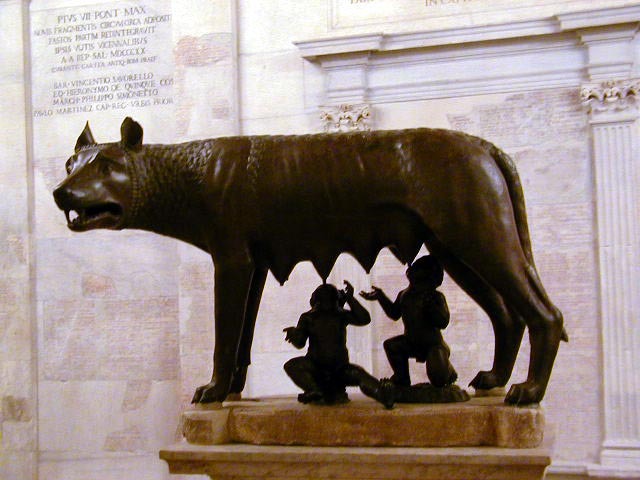 Funny thing though, the wolf statue isn't Roman, it is Etruscan, and the infants aren't Etruscan or ancient Roman, they were added during the Renaissance to create the Romulus and Remus theme. 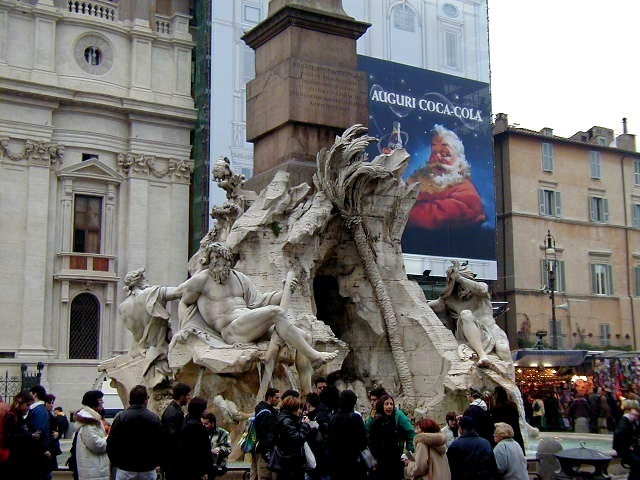 Continuing around Rome (there is a lot to see), are the Trevi Fountain, the Egyptian obelisk (every city has one, remember?) 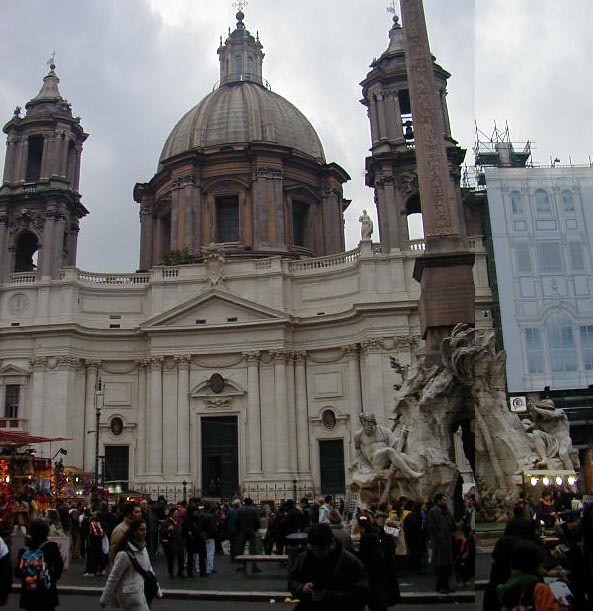 and church in the Piazza Navona, followed by a shot of the sculpture at the base of the obelisk. 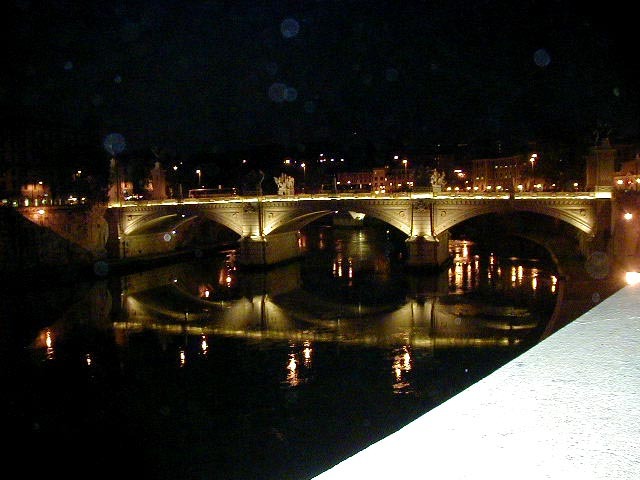 The last two pictures are the Castel Sant Angelo, and a night shot of one of the bridges across the Tiber. 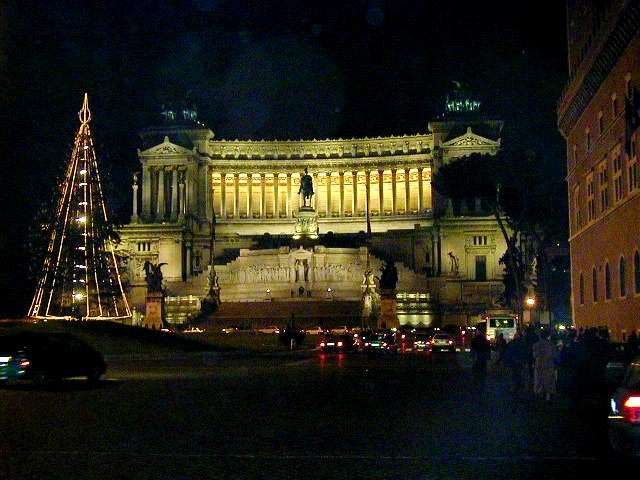 While Vatican City is in Rome, it is technically an independent state. I didn't create a separate web page on this technicality, I just wanted to split up all the pictures I took.